This post is part of an ongoing series that features the efforts of FIU in D.C., the team charged with advocating the university’s federal priorities. Highlights this week included President Mark B. Rosenberg and Provost Ken Furton meeting with federal health research partners and the CIA as well as a high-impact careers panel that gave students rich perspective on careers in Washington, D.C.
On Oct. 26, President Mark B. Rosenberg, Provost and Executive Vice President Kenneth G. Furton and Henry Artigues of the Office of Research and Economic Development met with Dr. Eliseo Pérez-Stable, director of the National Institute on Minority Health and Health Disparities (NIMHD); the visit was arranged by FIU’s Office of Research. Earlier this year, FIU was awarded a historic $9 million endowment by the NIMHD. President Rosenberg and Provost Furton meet with Dr. Perez- Stable, NIHMD Director. “This endowment means that FIU is on track to become one of the premier health disparities academic training and research programs in the country,” said Mario De La Rosa, a co-principal investigator of the FIU Health Disparities Initiative (FIU-HDI). The grant, which funds FIU-HDI, will serve to bolster the university’s capabilities to perform community-based prevention, treatment, and outcome research focused on HIV, substance abuse, diabetes, obesity and other chronic illnesses that disproportionately impact minorities and underserved communities in South Florida. 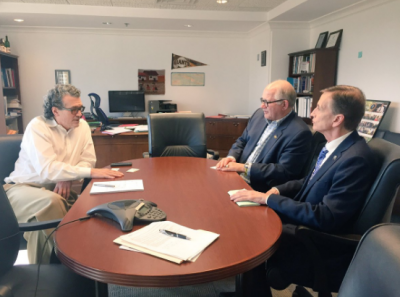 Rosenberg and Furton also met with senior CIA officials in an effort to further solidify and enhance FIU’s ability to support the development of a diverse and interdisciplinary workforce at the CIA, reinforcing the agency’s mission. The Steven J. Green School of International and Public Affairs’ Jack D. Gordon Institute for Public Policy (JGI) is a designated Intelligence Community – Center of Academic Excellence (IC-CAE). Recently, JGI launched the IC-CAE Intelligence Fellowship to build on its current program in national security and strengthen FIU students’ competitiveness in landing a job at the CIA, and in the U.S. intelligence community at large. 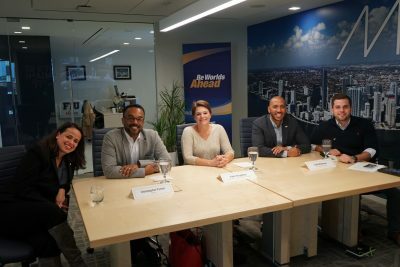 On Oct. 25, FIU in D.C. partnered with Campus Life, SGA and the Green School to host a webinar focused on making a difference in the nation’s capital through impactful careers. Panelists included Kate Houghton, CEO of the Young Adult Cancer Alliance; Tyrik Mckeiver, senior advisor at the US Department of State; and Cris Turner, government affairs director at Dell Inc.
You can watch the full-length High-Impact Careers in Washington, D.C. webinar here. The webinar will be followed by a two day Career Fly-in to D.C. on Nov. 16 and 17, during which high potential students will meet with employers and alumni; tour a national landmark; and gain professional development and leadership training. 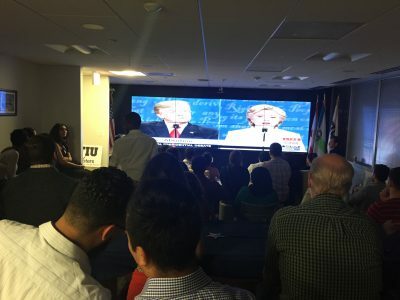 FIU in D.C. hosted a final debate watch party for alumni and friends in the greater Washington, D.C. area. With more than 50 in attendance, the watch party served as an opportunity to meet recent additions to the Panther network in Washington, D.C.
A few weeks are left to Make A Difference in the lives of FIU students without the financial means to experience an internship in Washington, D.C. Click here to help us reach our goal of $30,000 by the end of November. Bernardo Espanol, real estate student in town for an interview. Are you interested in learning more about jobs and internships in D.C. or interning in the city, and want to connect with the D.C. Panther network? Contact FIU in D.C.’s Career Success Manager Ethan Starkey at ethan.starkey@fiu.edu and click here to view current job openings.